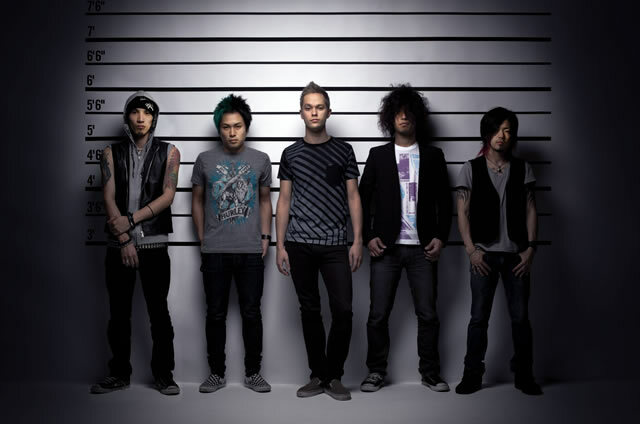 The five members from Nagoya: Masato（Vo）Y.C（g）Sugi（g）RxYxO（ba), and Katsuma（ds）formed coldrain in 2007. Masato holds dual-citizenship of Japan and America. His English lyrics combined with diverse skills, prime melodies, the stillness and movement controlled by the grounded rhythm section, the two intertwining technical and emotional guitars. After each musician played in their previous bands, they now form this band whose live performances become higher in quality and more overwhelming as they continue to steadily progress and rapidly advance. On November 5th 2008, they released their first maxi-single “Fiction” marking a striking debut! They self-produced and released their two full-albums and with their 2nd mini-album they started recording/producing their music outside of Japan. World famous rock producer David Bendeth (Paramore, Breaking Benjamin, Killswitch Engage, Papa Roach) produced their mini-album “Through Clarity”. Their compositions and sounds were even higher in quality and became very popular. “No Escape” became the tie-up commercial song for super popular game series Bio-Hazard’s newest game “Bio-Hazard Operation Raccoon City”. Their song hit the Oricon Daily Charts for the first time, ranking 10th, as well as 14th in the weekly charts. Their newest album “THE REVELATION”, released in April 2013, hit number 7 in the Oricon Weekly charts, showing a huge leap. After releasing their 3rd mini-album “Until The End” in 2014, they toured 14 locations in Japan, starting with Zepp Nagoya in their hometown, Nagoya. They gained high levels of performance skills and performed in many large events. Even outside of Japan, they were contracted by major management group, RAW POWER MANAGEMENT, and prestigious label, Hopeless Records. In the spring of 2015, they performed at the biggest rock festival of the southern hemisphere SOUNDWAVE FESTIVAL 2015 in Australia. They were praised highly by not only Australia’s local media but also the media in many other parts of the world. In 2016, they performed at America’s biggest tour “Vans Warped Tour”. A rare occasion for first-timers, they were selected to perform on the Monster Energy stage. Their momentum continues to grow.